Welcome to the Summer Soiree' at A Simple Kinda Life! My partners (Everyday Baby Steps and Moody Mama Says)and I have great things in store for you for the next 15 days! TeleNav is the global leader in location-based applications delivered via a mobile device. The first to launch a GPS navigation and mobile workforce management service on a cell phone in North America, TeleNav is partnered with every significant wireless carrier and device manufacturer. TeleNav offers products in 29 countries on 14 carriers covering one billion subscribers on 500+ devices—more devices than any other location-based services provider. * #1 handheld MRM product—Industry analyst firm, Frost & Sullivan, recently recognized TeleNav Track as the #1 MRM solution, with its 2008 North American Mobility Award for Best MRM Solution on a Handheld Device. TeleNav has also won many awards, including Best Places to Work in the Bay Area 2007. Learn more about TeleNav here. TeleNav GPS Navigator provides voice and onscreen driving directions on mobile phones and smartphones. TeleNav GPS Navigator surpasses in-car and standalone GPS systems with features that include easy portability, millions of additional business listings, voice-activated directions, and free updates to maps and points of interest—all at a fraction of the price of standalone systems. TeleNav GPS Navigator is used for both personal and business purposes, helping individuals make the most of their leisure or work time. 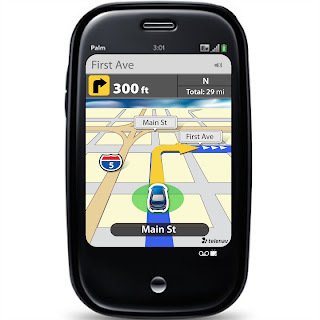 Enjoy premium GPS navigation right on your cell phone! * Get turn-by-turn driving directions by voice and onscreen. If you miss a turn TeleNav will automatically reroute you. * Find whatever you need wherever you are. Locate, call or navigate to restaurants, hotels, ATMs, Wi-Fi hotspots and more from a directory of over 10 million businesses. No more expensive 411 calls. * Avoid traffic jams with real-time traffic alerts and intelligent rerouting. * Access full-color 3D maps that are automatically updated. Two winners will win a 6-month subscription to this awesome service! To enter, Fill out the form. You can also try this service for FREE for 30 days. Extra entries are available and are laid out on the form. Remember, if you posted my Summer Soiree' button PRIOR TO JUNE 14TH AT MIDNIGHT, you are eligible to get 3 extra entries into any giveaway from now until the 30th, just check that checkbox on the form! *Don't forget to go to Everyday Baby Steps and Moody Mama Says to enter their giveaways!! Come back here and leave a comment, because for some reason, I can't modify the form to add that in as extra entries now that it's published!